Our terrace in my hometown in India looks down to acres of empty land. Empty of human occupation that is. To the left was 'the glorious land', there were trees as tall as our house, shrubs and bushes at every inch of the land that had been kept untouched and wild for no one had the time to clear that forest of sorts. On the right was the barren land, one that got cleared every few months for weeds and wild grass. We could look down at these two lands of extreme in its entirety divided by a tall muddy brick wall. During summers, monkeys would often sit on it and trespass into our garden area for treating on the mangoes much to my father's dismay. When it rained, the peacocks would show up on the barren land, spreading their glorious feathers dancing to the unassumingly rhythmic monsoons. It was as if, they were there from the neighbouring land to put up a show, or perhaps they were just looking for some privacy. Though they didn't seem to mind the elders and kids from our mohalla (residents of the houses in our lane) that would pass by our house to cheer the dancers. But it must be when we spotted a snake in or around our house that gathered the most crowd. How dangerous was it? Should we kill it? Was it just a rat eater? Was it poisonous? The kids hiding behind their mother's legs, watched the mohalla men chase the snake with a stick back to the woods. The length and strength of the snake was a matter of discussion for rest of the week. The men proudly narrated the story over and over until the glorious land send some other creature our way. When we went to our town this year, I was both scared and excited for my daughter Tasnim to experience some of that real human and animal circus. Sadly, after decades of wildness, the land was cleared by the owner. My mom confirmed though, the peacocks still come to put up a show. 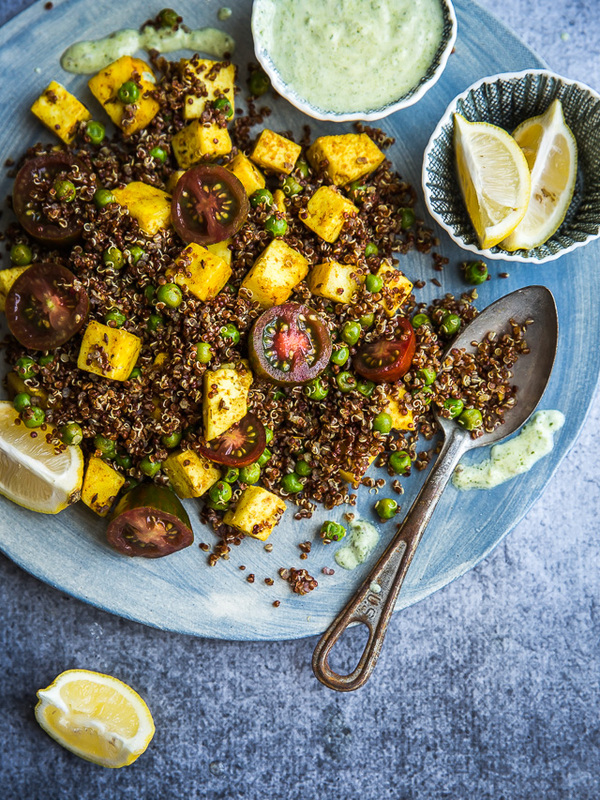 My daughter loves quinoa in salads and I'm continuously experimenting to introduce Indian food in quinofied form and this one has been on rotation for a while. Though it cooks like a dry curry, it is more like a salad. Additionally, I throw in whatever I might have on hand, shaved asparagus, tomatoes, sliced red onions, arugula or even some roasted cauliflower. Heat oil in a wok and add the cumin seeds. Once they crackle, add the ginger paste and spices. Tip in the peas and paneer and stir well to coat the spices on paneer and peas. Cook till the peas have softened. Add the garam masala and crushed kasturi methi. Add the cooked quinoa and toss well. Add lemon juice and season with salt and pepper. Serve warm or room temperature with yogurt. We serve it with a tablespoon of green chutney stirred in a cup of yogurt. Lovely post. I have just bought some quinoa I have never eaten it before, I also really love curry and paneer is a firm favourite. I am really looking forward to making this. Thank you for the recipe. 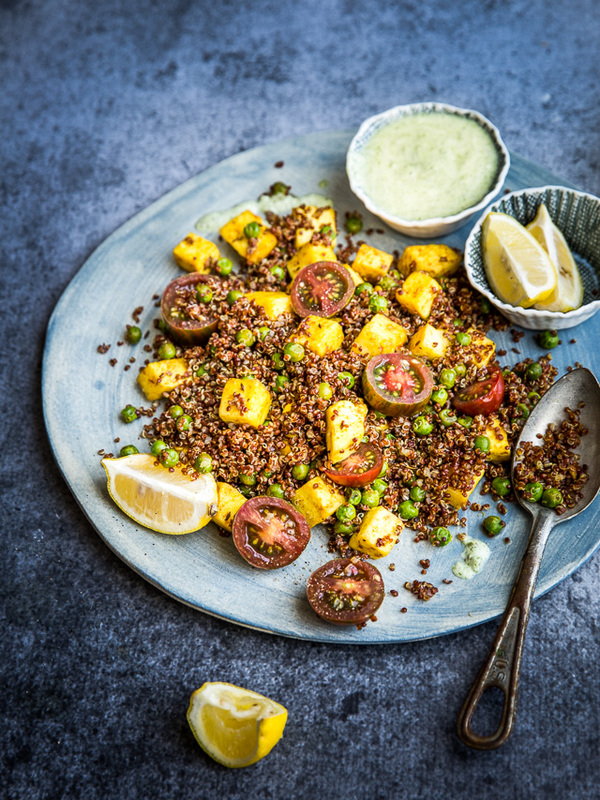 That quinoa dish looks fantastic, wholesome and delicious. I would love to visit and experience India. This recipe is such an awesome combination- can't wait to try it! This totally knocks my socks off! So yummy! This dish look absolutely fantastic. Can't wait to try it out! And the terrace sounds so wonderful! What a beautiful story, what a luxury to have peacocks dance in your backyard. I just loved the photographs, is the background handmade paper ?? Thanks Simi. It is a ready made wallpaper. Hi Sophie! I have a how to make paneer post on the blog. Hope you give it a go! Kulsum! I love your blog! Really it's so cool. I'v been playing around with some recipes involving masala and quinoa and came across your blog. It's beautiful! Really delicious and very healthy dish. Just loved the recipe. Will surely prepare it this weekend. I just made this and absolutely loved it - and so did my husband! 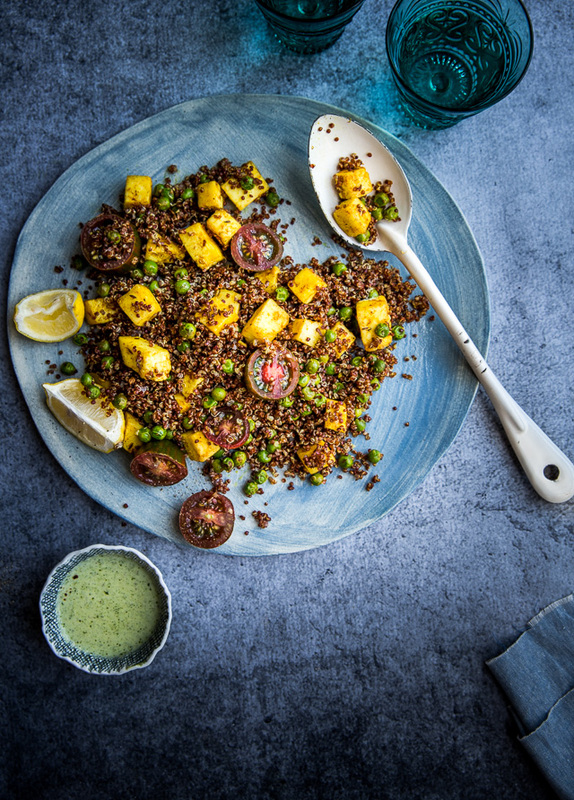 The spices were perfectly balanced and the quinoa paired so well with the peas and paneer. I also added roasted cauliflower and thought it was a great addition. I've saved this to my "Tried and True" board on Pinterest and am sure this will be in our rotation going forward. Thank you for the delicious recipe!